NYC party boiiiiiiz Homage first foray into the label game comes via a four track EP from Brighton-based disco producer Tech Support – who, with no discography to his name aside from a couple self-released EPs on Bandcamp, is also essentially making his debut here. The Tech Support formula – as is displayed on this EP – combines bangin’ and funky percussion with classic discoboogie flavors to craft modern midtempo edits that are nicely beefed up for the dancefloor. And with that introduction, let’s take a gander at Inside Out. “Feel It”, which is our premiere for today and sits in the A1 slot of the record, employs those beefy beats mentioned earlier to start things off. A thick kick/clap combo adorned by tasty auxillary percussion builds and breaks (with birds chirping in the background) before being joined by the glorious horn section of the main course. The arrangement loops a nice little boogie lick; mean bassline, sweet guitars and a fluttering synthesizer stab included. Next thing you know, the vocals are joining the party. It’s a clever little cut that extends the most savory components of the original into an extended, midtempo disco joint that could sit with ease in a housier set. Accompanying the lead track is a grip of three more cuts of disco house sleaze, which will surely be revealed by other outlets in the coming weeks. Inside Out is a nice little introduction to both parties involved. 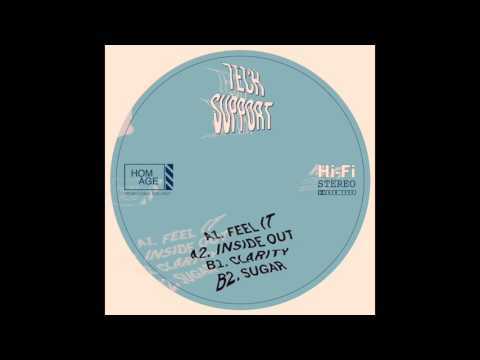 Tech Support blends the boundaries between disco edits and more nu disco/indie dance production here, combining both heavy sampling as well as his own hardware work. Meanwhile, Homage gives us a taste of what’s to come from the label – party rockin’ sample based cuts and edits designed for the New York dancefloor. The Inside Out EP is due out in the coming months and will be available on vinyl and digital formats. Pre-order on Juno are already online!